Which Countries Are the Worst-Rated for Censorship and Surveillance in the World? #infographic ~ Visualistan '+g+"
Which countries have been rated the worst in the World when it comes to both censorship and surveillance? In today's age of information and digital innovation, you're able to connect with anyone in the world within seconds. People all over the globe use the internet to get their news, commerce, entertainment, communication, and much more. The internet was invented to be used as free technology for anyone who would be able to access it. However, some countries definitely engage in harsh censorship and internet surveillance. 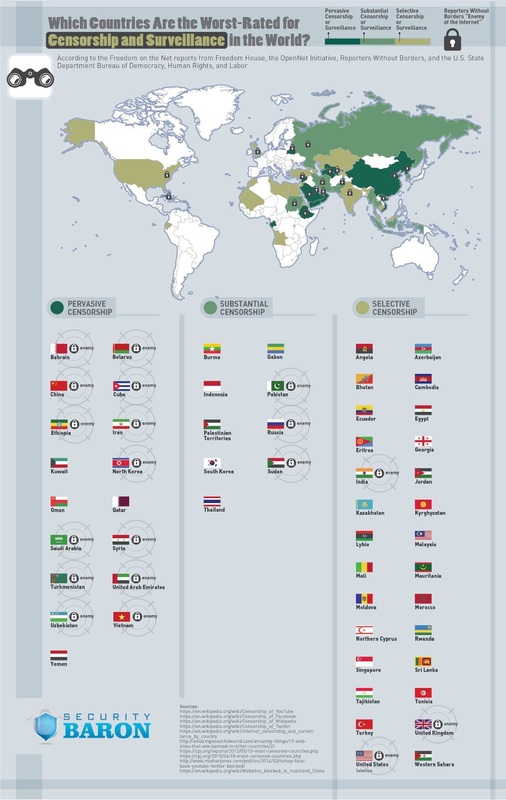 This infographic from SecurityBaron takes a look at which countries around the world are the worst-rated for censorship and surveillance, and how they stack up with others. Where does your country land on this list?